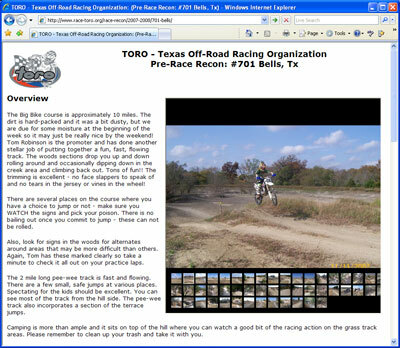 For the 2007-2008 TORO race series we are creating multi-media pre-race recons for our members. This will feature images served from flickr, helmet cam footage from youtube, and geo located images on a google map at various points on the race track. Here is the 1st TORO pre-race recon for race #701 Bells, TX (11/18/07).